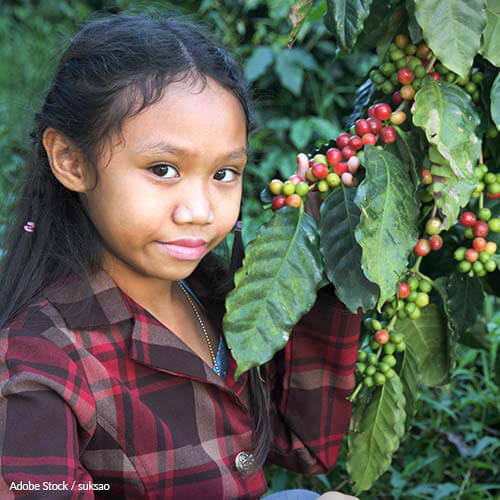 Worldwide, 25 million coffee farmers make it possible for 2.25 billion cups of coffee to be consumed each day. It's a $19 billion dollar industry relied upon by over 120 million people in more than 70 countries. By 2080, climate change could render coffee extinct. This means that 25 million coffee farmers—who hail from the equatorial environments where coffee can grow—could no longer support their families. This means that those reliant on coffee could become displaced, out of work, and seeking refuge. This means that, if we can't drastically slow climate change, the best way to combat this issue is to better fund the research of agricultural innovation. Without innovation, coffee won't survive—it won't be able to grow on mountain sides; it won't be able to withstand vicious pests that thrive off of the rising temperatures. Without innovation, 120 million people could lose their livelihoods. Sign below to request the reallocation of funds from the International Fund for Agricultural Development (IFAD), so that agricultural innovation gives coffee and its farmers a fighting chance against climate change. Unless there soon comes a drastic reduction of emissions worldwide, climate change will devour one of our key global crops: coffee. Specifically, a recent report from The Climate Institute predicts that, at its current rate, climate change will cut the global area suitable for coffee production by as much as 50 percent. They also project that 30 years from then, in 2080, wild coffee will officially become extinct. If this happens without interjection, 120 million people in 70 countries reliant upon the $19 billion coffee industry could find themselves unable to make a living. We can't let this happen. So I write to you today to help spark that interjection, to guide your attention to the 25 million coffee farmers who—in order to overcome the obstacles that come with shifting plantations up mountain sides; in order to maximize yield despite rising temperatures; in order to combat vicious pests that thrive with climate change—are in need of innovation they can't currently fund. I write to you so that funds of the International Fund for Agricultural Development may be reallocated, and that innovative techniques for these farmers become IFAD's utmost priority. Without such a shift, these farmers and their families run the extreme risk of perishing with the crop whose demand they've lived off of for years—a scenario no one on this earth should face. That's 3,229 signatures! Let's keep the ball rolling.